You guys I am so excited to share this recipe with you. It’s such a good one pulling together some of my favorite flavors and textures right now in this transition time from winter to spring. Eating as much citrus as I can right now to brighten up these grey cold days. For this salad I marinated mixed beans, also known as pulses. Pulses are protein-packed, sustainable foods known as dry peas, chickpeas, lentils and beans. And one of my favorite quick and easy meal staples in my house. For textures and visuals (I am a stylist after all) I did a mixed bean of different sizes and flavors, tossed it together with lots of herbs, olive oil, shallot and white wine vinegar, and let that sit while I roasted the beets. The beets are then wedged after roasting with olive oil and salt, and then tossed with juicy grapefruit, which then is also tossed in a little white wine vinegar. 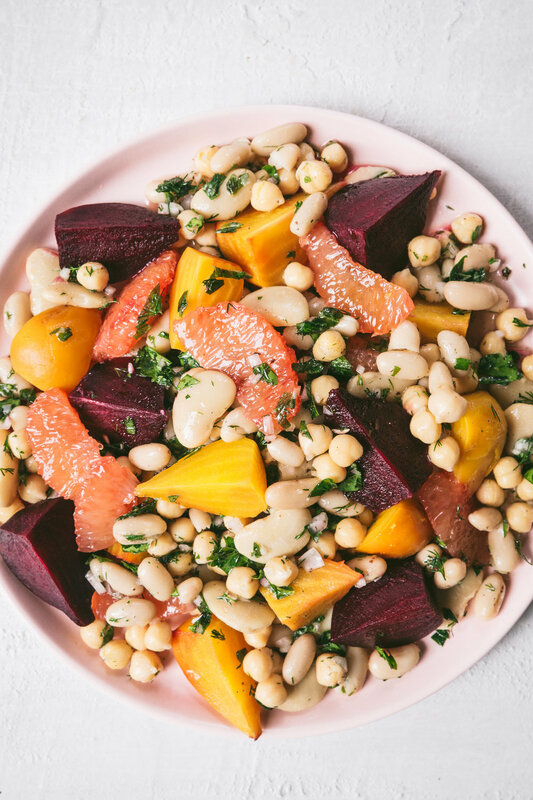 Together both the mixed beans and beets with grapefruit get tossed together creating a refreshing, yet filling, salad. If you are looking for quick easy ways to up the nutritional value in your meals, simple add pulses. Mix some into your soups, salads, and pasts. Put some pulses into your food processor, add lemon juice, garlic, olive oil, salt and pepper and puree into an awesome dip. 1. Put your beans in a pot and cover them in a few inches of water. Place the pot in the fridge overnight. 2. Next day, drain them and thoroughly wipe out the pot. Place the soaked beans back into the pot and cover them with a few inches of water. Bring to a simmer, and a small pinch of kosher salt. 3. From here you can add onions, shallots, garlic, rosemary, sage, bay leaves, thyme. Anything really! 4. Simmer for about 2 hours, salting in the meantime, tasting the broth and adjusting. 5. Once the beans are tender, turn off the heat. Taste and continue to add more flavor where you want it. 6. Strain the beans from the liquid and allow to cool (for this recipe! ), but remember to save the liquid (can even freeze it) for future soups. 1. Preheat oven to 375 degrees. Rub washed beets with olive oil and salt, then wrap in aluminum foil and place on a baking sheet. 2. Roast for about 45-60 minutes until tender. Unwrap the beets allowing them so cool. Then rub off the skins (this can be done with a paper towel to prevent some beet juice on hands). Cut beets into wedges and place in a medium bowl. 3. Cut the skin and pith from the grapefruits, then cut in between membranes to release sections. Place grapefruit sections into bowl with the beet wedges. Toss with 1/3 cup white wine vinegar, salt and pepper and set aside. 4. In a small bowl combine finely chopped shallot with 3 tablespoons of white wine vinegar, set aside. 5. Mix together herbs and 1/3 cup olive oil. Add the cooked beans and toss together. Add the shallot mixture and the beets with grapefruit. Toss together and season with sumac, salt and pepper. This post was sponsored by USA Pulses and Pulse Canada.